All good things must come to an end. In my case, there was some debate as to whether things would end at all on Saturday night, as I had inadvertently stuffed everyone to the point of no return. Feeble protests of ‘just a little breather’ were heard from various corners of the table, and being a polite hostess I acquiesced, leaving the evening’s coup de grace sitting neglected in the kitchen. However, when it became clear that this breather might extend until the next morning, I forced upon my guests the only antidote I trust to swiftly combat overindulgence: copious amounts of brandy and espresso, the first to numb the stomach and the second to jolt the digestive organs back into action (very scientific, I know). Hey, desperate times call for desperate measures. Sure enough, ten minutes later, as if on cue, people were perking up, rubbing their eyes and murmuring that they might actually be able to fit in some dessert. Heaving a silent sigh of relief, I brought out the cake. Let me tell you a little bit about this cake. I’m not normally drawn to cakes, at least not to American-style spongy frosted cakes, because apart from the frosting things usually tend to taste remarkably similar to nothing. When I make cakes, I tend to make gâteaus or tortes, which have lots of interesting layers of whipped cream, custard and ganache, as well as plenty of fruity, oozy, fudgy, sticky, or crunchy bits that make it a whole lot more exciting to eat. To tempt me into making it, a plain cake has to offer something out of the ordinary. To be honest, I didn’t know what to expect from this cake when I picked the recipe out of the book*. I needed an interesting dessert to show off my new lavender, and this seemed like a safe bet, though I wasn’t sure how people would react to this nontraditional flavor. At best, I figured, it would be a novelty – something that would cause people to exclaim ‘wow, this is interesting’, or ‘wow, how unusual’, but not something that would cause me to sneak out of bed in the middle of the night to have the leftovers all to myself. How wrong I was. This cake is delicious. Really, really delicious. The lavender is very much there, lending its unmistakable earthy, herbal perfume, but it in no way overpowers the orange and almond – in fact, it seems these three flavors were made for each other, as each lets the others shine through like different voices in a barbershop quartet. They work together, somehow managing to be simultaneously subtle and intense. The cake is citrusy and fresh and nutty and floral; it’s also buttery and moist and has the perfect amount of resistance under the fork. You could serve it with whipped cream, ice cream, yogurt or nothing. People did unanimously say ‘wow’ upon tasting it. It wasn’t just any ‘wow’, however – there was no ‘wow, how interesting’ or ‘wow, how unusual’. It was the ultimate in wows – a simple, plain, crumbs-spilling-out-of-full-mouth, ‘WOW!’. Put the lavender and some of the sugar in a clean coffee grinder (or a food processor) and grind to a powder. Combine this with the rest of the sugar. Cream the lavender sugar and butter together until light and fluffy, then add the orange juice, zest, almond extract and the eggs. Sift together the flour, baking powder and salt, and beat into the wet mixture, along with the ground almonds. Pour the batter into a 9-inch greased and lined springform pan. Sprinkle the flaked almonds evenly over the top, and sift the powdered sugar over them. Bake in a preheated oven at 350F/180C for 40-50 minutes, or until a toothpick inserted in the center comes out clean. Cool the cake, unmold and sprinkle with the remaining teaspoon of dried lavender. *Crazy Water, Pickled Lemons, in case you’re just joining us. We seem to have very similar tastes in cakes – while icing and frosted confections may be the flashiest of the baking world,their denser, richer cousins are the ones that have my heart. I love the idea of this flavour combination … the orange and almond are classic partners, but the lavender sends it over the top! Sounds, and looks, sublime. Yeah, it really surprised me. I especially liked the fact that it wasn’t too sweet, and I think it would be a good afternoon-tea cake, or even a coffee/brunch-type cake. I even ate it for breakfast, but I’ve been known to eat ice cream for breakfast, so maybe that shouldn’t count. Anyhow, thanks for dropping by! Hi Melissa, of course I was waiting anxiously for the grand finale and it didn’t disappoint! You are really making me want to get that cookbook. The lavender would be such a new taste experience that I would love to try. Was it your idea to use the lavender or was that in the recipe? This sounds heavenly. The smell of almond, lavender and orange must have been fabulous. I can’t wait to give this recipe a try, michelle. Hi Michele! In fact, the recipe itself calls for lavender. This recipe, along with another two or three in the same book, were what inspired me to seek out lavender in the first place, which I found over the internet. I did really minimal tweaking of this cake, at least by my standards – I added the almond extract, the salt (am I the only one who can’t stand saltless cakes?) 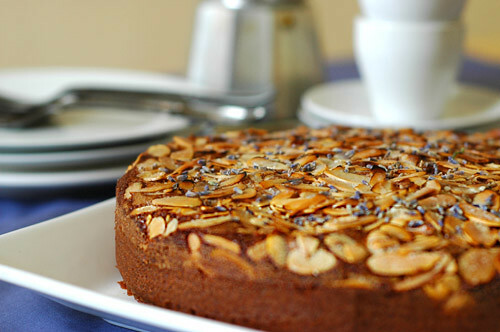 and the almond topping (she has a topping of cream cheese and candied orange peel, if I remember correctly). But yes, I *highly* recommend this book, if that hasn’t become clear by now 😉 (I’m really starting to feel like a broken record…)And hi Ling! Thanks for dropping by and I’m sure you’ll love this cake! Melissa, this cake is absolutely gorgeous, and your description of its flavor–not to mention the whole evening–is wonderfully eloquent. I’m a sucker for anything rich and almondy, not to mention orangey or with a hint of lavender. Lovely post! Hi Michele, the cookbook should be available at any larger bookstore, like Waterstones. I hope the recipe works out for you – let me know how it turns out! Recently discovered your blog and love both your writing and your seemingly exquisite taste. I’ve ordered a copy of the book myself despite vowing to cook only from the books I have. Too tempting! I wanted to ask you how much of the gorgeous feast you prepared could be made ahead of time (ice cream definitely could and I think probably the cake as well). What do you think? Looking forward to your next culinary triumph! Hi Valentina – Thanks for dropping by and letting me know! I’m happy to hear that you find the book as wonderful as I do. It’s a rare cookbook that inspires me as much as this one! Hi Page – The recipe in the book suggests a topping made from creme fraiche, powdered sugar and orange zest, which I imagine would be delicious and fresh. If you need something a bit firmer, why not make a cream cheese frosting, or a citrus-scented buttercream? The only thing I would try to avoid was icing it with something that would overpower the cake’s delicate flavors. Good luck, and happy birthday to your little girl! Hi, this is the very firts recipe of your blog I try, and it came our delicious! ?I was worried about the lavender taste being too strong but I find it is just perfect. Only one thing: I would use less sugar next time but it is only because I like sweats not to be too sweats…I will try your lemond almond torta as soon as possible, I bet it’s delicious! I found some lavender extract at Sur la Table. I'm going to try that in this recipe. I baked this last night for my wife's birthday yesterday; it was simply amazing!! By the way, I found culinary lavender at William-Sonoma.